Every year, the US Census Bureau publishes data on the characteristics of new single-family homes started in its Survey of Construction, including data on full and half bathrooms. 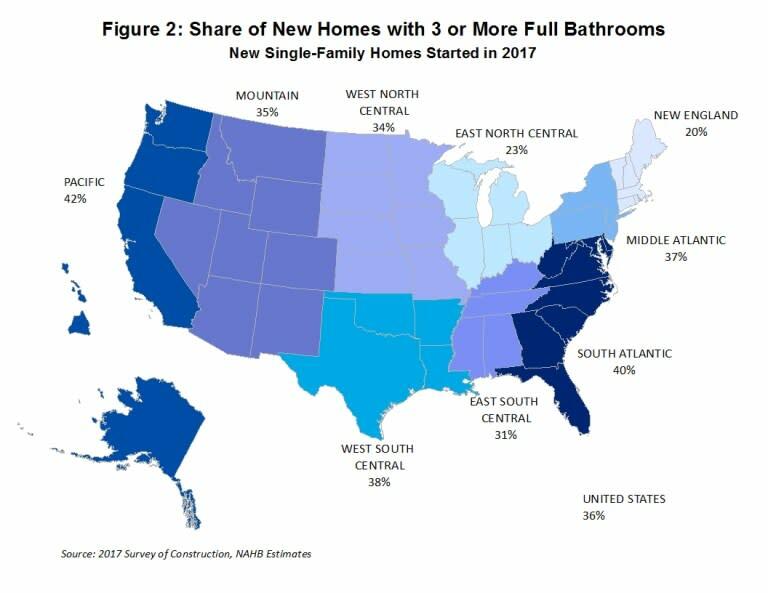 In 2017, 4 percent of new single-family homes started had 1 full bathroom or less, 60 percent had 2 full bathrooms, 27 percent had 3 full bathrooms, and 9 percent had four full bathrooms or more (Figure 1). 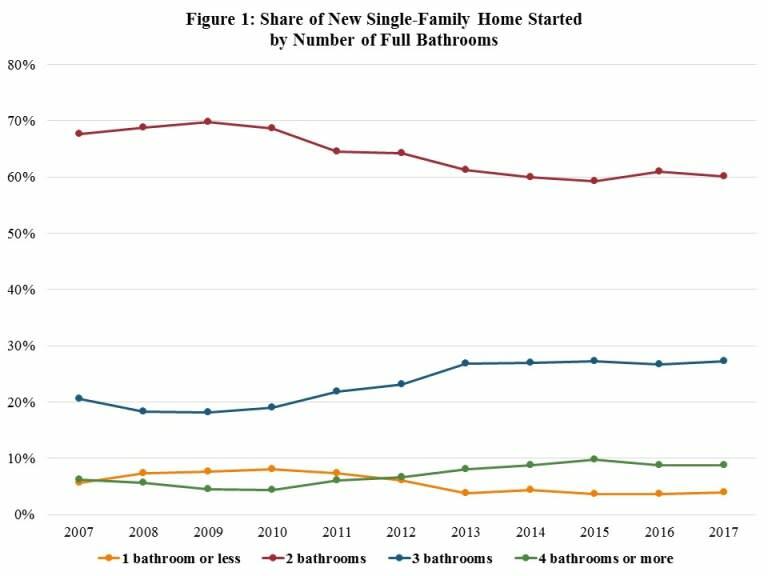 In the post-recession era (starting in 2009) there was a steady rise in the share of new single-family homes with three or more full bathrooms and a decline in the share with 2 full bathrooms or less (Figure 1). Since 2013, however, the shares of new homes by each bathroom grouping have been essentially flat. While the number of full bathrooms in new homes has been fairly stable, it is most likely the case that the size of these bathrooms has decreased, as the average square footage of new homes has declined since 2013. The number of full bathrooms in new homes varies by Census Division (Figure 2). For example, the Pacific Division has the highest share of new single-family homes — 42 percent – with 3 or more full bathrooms, closely followed by the South Atlantic Division (40 percent). In contrast, only 23 and 20 percent of new homes in the East North Central and New England Divisions, respectively, have three or more full bathrooms. From 2016 to 2017, the Pacific Division saw the largest percentage point increase in the share of new homes with three or more full bathrooms (5 percentage points), while the New England region had the biggest decline, dropping by 3 percentage points. The SOC also tracks half bathrooms in new single-family homes. 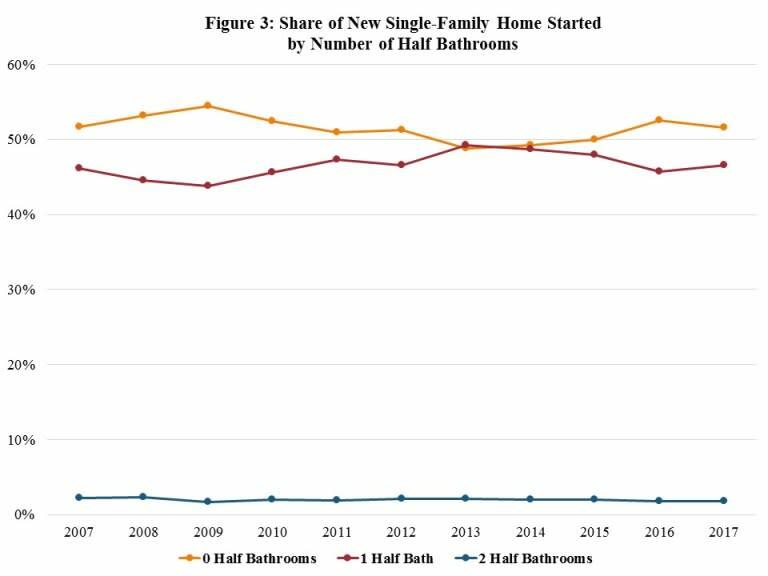 As seen in Figure 3, the shares of new single-family homes with either zero, one, or two half bathrooms has been relatively stable since 2007. The 2017 data shows that it is slightly more common for new single-family homes to have zero half bathrooms (52 percent), compared to 1 half bathrooms (47 percent). The share of new single-family homes with 2 half bathrooms is negligible at 2 percent.